Wow, I didnt even know Paul could act that well. I mean, Ive seen him in some of the shows skits and The Tony Mendez Show, but never thought anything of it. Good for him. 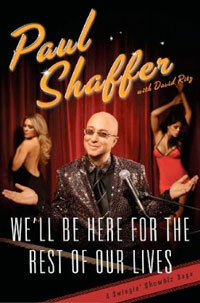 My childhood would have been very different if George Costanza had been played by Paul Shaffer. A friend of mine spent time backstage occasionally at the Letterman show, working. She says Dave is very nice, Paul is consistently a jerk. I thought Howard Shore was the bandleader/musical director for the first years of SNL. Paul was piano/keyboard player in the band, and gradually started getting credited for special musical material and appearing in skits.